Helping promote healthy ears for clear, undisturbed hearing, NativeRemedies® TinnaRex™ works to encourage inner ear balance, while supporting all body systems involved in optimal ear performance. The herbal supplement helps support health and function of all ear structures for efficient sound conduction and conveyance. In addition, this hearing supplement helps encourage health and balance of the nervous system and enhances circulatory and cardiovascular health. Do not use with Warfarin or other blood thinners. 60 ml. 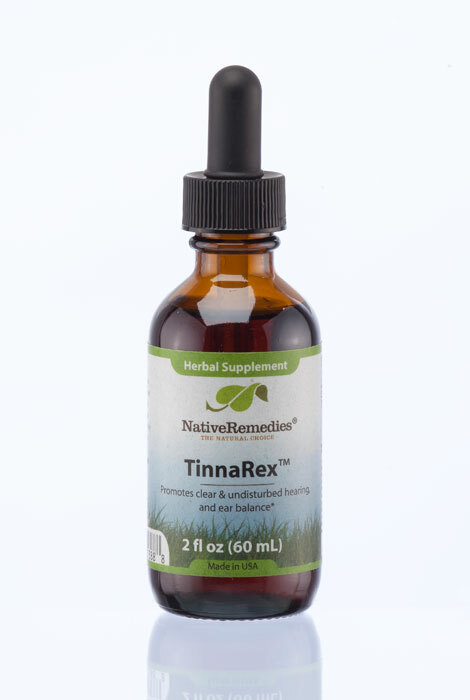 TinnaRex is a 100% herbal formula and contains the following ingredients in therapeutic dosage: Maidenhair tree, Rosemary, Oatstraw, European vervain. Maidenhair tree (Ginkgo biloba) is derived from one of the oldest trees on Earth and has been used in traditional Chinese medicine for centuries. Its beneficial properties have only been discovered by the West during the last 20 years, where clinical studies have indicated its effectiveness in supporting the functioning of the circulatory system and improving common conditions associated with the normal aging process. It has been researched for its ability to support healthy hearing. Rosemary (Rosmarinus officinale) is often used to support health and strength in blood vessels and is also an excellent circulation tonic. Rosemary acts as an invigorating herb, promoting balanced mood and imparting energy and a zest for life. Oatstraw (Avena sativa) is made from the wild oat plant and is a well-known restorative and nerve tonic. Avena sativa is also effective in maintaining healthy circulation. European vervain (Verbena officinalis) is well-known for its ability to relieve common tension and stress and to promote balance and harmony in the nervous system, supporting feelings of well-being. Adults & Children 10+: Take 0.25 mL in 1/4 cup of water 3 times daily. Caution: Do not use concurrently with Warfarin or other blood thinning medication. If pregnant or breastfeeding, ask a health professional before use. If symptoms persist or worsen, consult a health care professional. Keep this and all medicines from the reach of children. One 60 mL bottle of TinnaRex will last approximately 80 days.